The place is located in Creston, Washington, about 50 miles west of Spokane. It encompasses 220 acres and is home to 30 retired Thoroughbred racehorses. It's called Down the Stretch Ranch. Over the course of the last three years it has also been a place that has hosted approximately 100 U.S. military war veterans, all of them battling post-traumatic stress disorder, on stays ranging from two days to two weeks. It's a place for what's known as equine therapy. 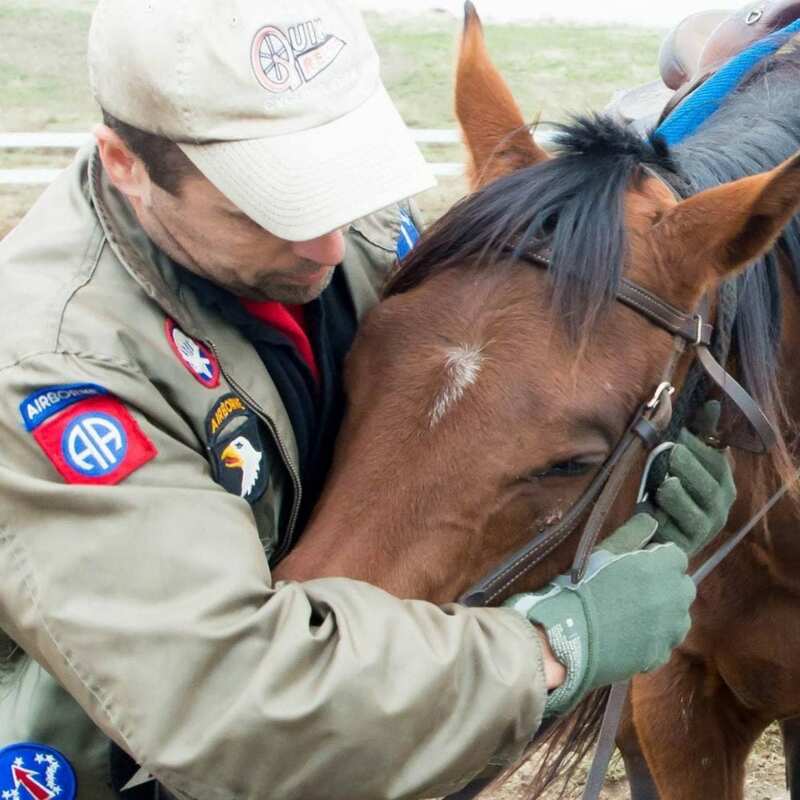 In simple terms, the veterans are put in physical touch with the horses, and in ways and for reasons not easily explained, invisible healing can get done. In the case of Down the Stretch, equine therapy helps men who have witnessed the horrors of war, engaged in battle on foreign soil, and brought home the resultant mental and/or physical wounds needing treatment. At many other farms and ranches across the country, equine therapy has been proven to help not only veterans, but those with physical or mental disabilities. Scholars can debate the origin and author of the statement, generally attributed to Winston Churchill: “There's something about the outside of a horse that is good for the inside of a man.” Boone McCanna, whose idea it was to start Down the Stretch, has no quarrel with the sentiment. The McCanna family has long been a prominent one in racing in the Pacific Northwest. 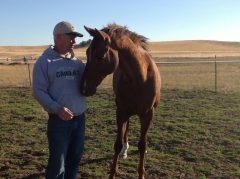 Boone, a captain on the University of Idaho's 1987 Big Sky champion football team, has more than 30 years in the business, most of them as a jockey agent in Washington and Northern California. His client list included Kevin Krigger, Dennis Carr, Frank Alvarado and Ricky Frazier. His brother, Tim, is in the Washington racing Hall of Fame, having saddled more than 2,000 winners in his career. McCanna expressed his desire to end his jockey agent career, return home to Washington and start what became the Down the Stretch Foundation and take care of both retired Thoroughbreds and returning veterans to Hollendorfer at Golden Gate Fields. On Monday, as part of a special tribute for Veterans Day at Del Mar, two of the soldiers helped at Down the Stretch – Jerald Reichel and Jose Cruz – will spend a day at the races, a first for both. The track will honor them in a short ceremony after the day's 4th Race. Reichel joined the Army in 2002 and served two tours in Iraq, the first from March 2004 to February of 2005, the second from August 2008 to October of 2009, earning a dozen medals. Cruz joined the Marines in 2001 from Kennewick, Washington and was trained at MCRD San Diego and Camp Pendleton. During his service he was schooled as an electrician and in military martial arts, and went on to become a martial arts trainer himself at Camp Pendleton. He spent 12 months in Iraq in 2007-08 at bases in Ramadi, Baghdad and Fallujah. Hollendorfer provided the plane fare for Reichel and Cruz to come to San Diego. Two-time Kentucky Derby winning trainer Doug O'Neill is footing the hotel bill. Thoroughbred owner Nick Alexander and auto dealer Nick Alexander are providing a truck to Down the Stretch for the one at the ranch that recently broke down. O'Neill recently had a number of “coolers” – blankets draped over horses after exercise or races – which have the Down the Stretch logo and the phrase “connecting veterans and retired Thoroughbred racehorses” on both sides. They were on display for all of O'Neill's horses at the Breeders' Cup at Churchill Downs on November 2-3. Tom Knust, a former Marine whose recovery from wounds incurred in Vietnam was considered miraculous, is the agent for jockey Mario Gutierrez, who rides first call for Team O'Neill. Knust also has thrown his support behind Down the Stretch. Boone McCanna and his 84-year-old father, Dan, run the daily workings of the ranch and, as in most any such enterprise, funding is a constant worry. Down the Stretch was recently re-accredited by the Thoroughbred Aftercare Alliance and has applied for grants from the State of Washington. But McCanna concedes that “It has been a struggle at times over the last three years.” He noted that, quite simply, additional funding would increase the ranch's ability to better serve more veterans and take care of more retired Thoroughbreds. This entry was posted in NL Article, People and tagged boone mccanna, Down the Stretch Ranch, equine therapy, post traumatic stress disorder, thoroughbred, veteran by Hank Wesch /Del Mar. Bookmark the permalink.